At 7 o'clock on a May morning in 1671 a cloaked man disguised as a parson arrived at the Tower of London to meet Talbot Edwards, Keeper of the Crown Jewels. 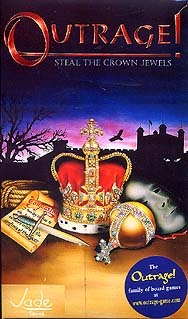 The visitor was an Irish adventurer, Colonel Blood, and his intention was to steal the Crown Jewels. Welcomed as a friend, he was allowed to view the Jewels. Edwards was knocked senseless. Colonel Blood concealed the Crown beneath his cloak. One accomplice filed the Sceptre in half while the other stuffed the Orb down his breeches. At the last moment Blood's plans were foiled. The cry "Treason - the Crown in stolen!" rang around the Tower. The Yeomen gave chase amid confusion and pistol shots. The Orb rolled into a gutter. Colonel Blood and his fellow traitors were caught within an ace of escape. This has been the only attempt ever made (so far) to steal the Crown Jewels. Can you succeed where they failed? Pocket version of Outrage!, with magnetic playing pieces.